I often have trouble trying to make any rational sense of why I love certain films and sitting high on that list of head-scratchers is Wes Craven’s Shocker. 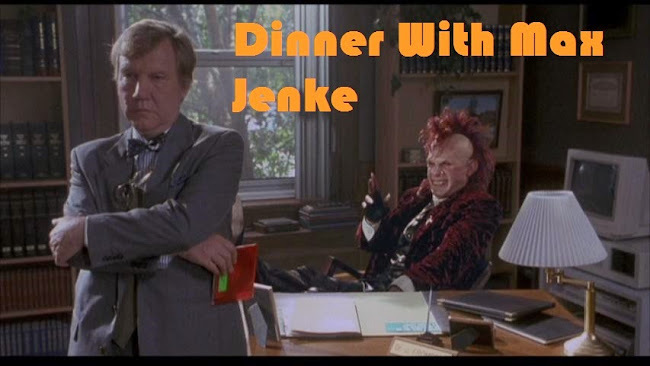 I caught Shocker in the theaters way back when and I’m not sure what my state of mind was on that fall night back in ’89 but clearly I was extremely open to what Craven was dishing out. I was so open to it, in fact, that while it was still in theaters I would happily tell anyone who asked that, yeah, it was great – go see it! It was only once it hit video that it finally dawned on me that Shocker might not hold much appeal for anyone else – even if it did boast one of the best metal soundtracks of the era. Shocker was intended to be, at least in part, Wes Craven’s strike back at New Line for the direction they took the Elm Street franchise. Craven and New Line never quite saw eye to eye on Freddy and as they owned Freddy down to the last thread on his sweater, they called the shots, leaving Craven to stew on the sidelines as his dream stalker was turned into an increasingly corny, MTV-friendly jokester. 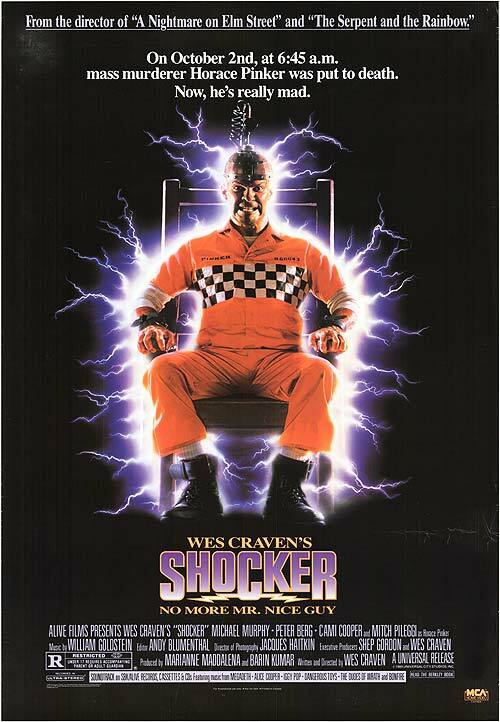 With Shocker, made for Alive Films and distributed by Universal, Craven hoped to repeat the success he had with Freddy and create a new, sequel-ready horror superstar, this time around having full participation in the ensuing franchise. 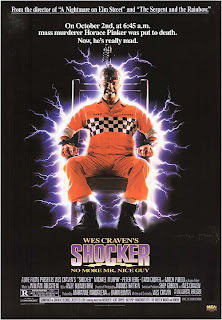 Unfortunately, despite the electronic affinities of its villain, Shocker didn't make lightning strike twice for Craven. 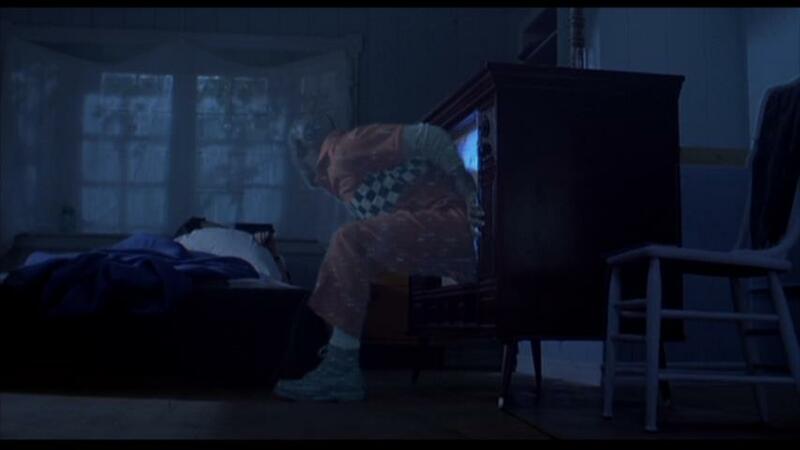 Shocker’s story involves Jonathan (Peter Berg), a college football player who, in a precognitive dream, sees the majority of his adoptive family slain at the hands of serial killer Horace Pinker (ferociously played by Mitch Pileggi, still a few years away from his most famous role as Skinner on The X-Files) the same night that the horrible deed happens and he uses the clues that he saw in his dream to help his police captain father (Michael Murphy) track the psycho to his dilapidated TV repair shop and bring him to justice, after which he is swiftly sentenced to death. While in real life, Pinker would've sat on Death Row for years while his lawyers filed appeal after appeal, in Shocker Pinker is sent to the hot seat in no time. However, throwing the switch on Pinker only turns him into an even bigger threat as he uses black magic to allow his spirit to survive his electrocution. His new state of existence allows Pinker to transfer his essence from one living host to another and he zaps his way from one unwilling host – cops, little kids, etc. – to another as he tries to take Jonathan out of this world. Shocker grows increasingly daffy as Pinker’s powers in the electronic realm increase, climaxing in one of the most outlandish final chases in slasher history as Pinker and Jonathan both enter the electronic world and chase each other at length across every channel on television – running through news broadcasts of street riots, archival footage of the Hindenburg disaster, a religious program (hosted by Timothy Leary in a cameo role as a televangelist), rock concerts, and even Leave It To Beaver. It’s often said that if you give someone enough rope they’ll hang themselves and that’s the case here as Craven sends Shocker off the rails in spectacular but fascinating fashion. 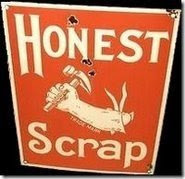 That said, the sincerity that Craven shows towards his material is apparent. On one hand, Craven was trying to create another cash cow to rival Freddy, which is – on the surface – a cynical venture. But on the other hand, it’s plain to see that Craven was very genuine in regards to putting some heart and thought into Shocker. With its satirical jabs at television and the media culture, the movie is like a dig at the glib “fast food” mentality that New Line applied to the Freddy sequels. The fact that everything in Shocker doesn’t quite gel doesn’t diminish my admiration of the attempt. And if nothing else it also must be noted that Pinker crawled out of a TV screen many years before it became the signature move of Ringu's Sadako. I no longer regard Shocker as being especially good but I do regard it fondly. It's kind of a mess but it bristles with its own lively brand of electricity. Some things are just awesome and there's no debating it. Like the above cover to Marvel Team-Up #15. Seriously, what's not to love about that? Illustrated by the cream of the crop likes of Gil Kane and John Romita Jr., this has got bad assedness burned into every line. 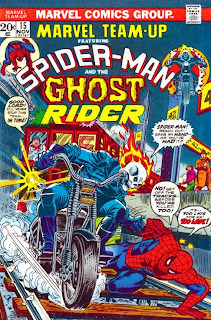 Ghost Rider staying just ahead of an onrushing subway train, trying to pick up a dazed Spidey before they're both crushed by however many tons of screaming metal are bearing down on them? Daaamn!! And it could all be originally had for the low cost of 0.20? 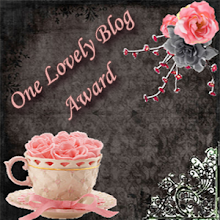 I practically consider that stealing! Even by the '80s, covers like this had already fallen out of fashion in comics in favor of less hyperventilating depictions of excitement (no more words balloons with breathless exclamations like "Good Lord! I'll never stop this train -- in time!") and, for the life of me, I don't know why. It's the same with horror movie posters. Once they reeked of hyperbole and promised lurid entertainment but that kind of zealous hucksterism became considered...I don't know...cheesy? Again, I don't get it. Why would you ever think that making something less awesome is better? It's enough to make you throw up your hands in exasperation. Now, it should be said that the comic behind this cover isn't so hot. Scripted by Len Wein with art by Ross Andru (the most unsung Spidey artist of them all), "If An Eye Offend Thee..." is the somewhat routine account of Peter Parker and Mary Jane, both out at Madison Square Garden to see Ghost Rider's Motorcycle Extravaganza when Peter has to ditch MJ to help out as Spidey as the Ghost Rider tangles with The Orb and his motorcycle minions. It's servicable enough as team-ups go...just not nearly as gripping as the cover would suggest. But hey, that cover is tough to live up to. The world is full of many things created by man that remind you of the madcap majesty that some gifted souls are capable of. Things that make you go "Wow, that's something!" Or words to that effect. The ceiling of the Sistine Chapel, the Great Pyramids...and the cover to Marvel Team-Up #15. Labels: Ghost Rider, Gil Kane, John Romita, Len Wein, Marvel Team-Up, Ross Andru, Spider-Man, Sr. In 2002, Marvel gave indie comic icon Peter Bagge (Hate) a one-shot issue, outside of normal continuity, to poke subversive fun at their flagship character, imagining everybody's friendly neighborhood Spider-Man as an angry misanthrope, out to cash in on his fame. It was a funny tweaking of the Spidey story, the kind of "What If?" that can only occur off to the side of the carefully shepherded status quo. Companies like Marvel and DC are always mindful not to alter their core characters too much as so much rides on their ready familiarity. In comics - mainstream superhero comics, at least - creativity must always be juggled with the overriding directive to protect the brand. That push and pull of art and commerce makes the never-ending tapestry of superhero narratives irksome to some and fascinating to others. As characters like Spider-Man, Hulk, Batman, and Superman are forever denied a definitive end to their stories, there has to be the illusion of change in order to maintain interest. They'll get married, or be injured (seemingly permanently), or be killed (again, seemingly permanently), or something dire will happen to a key cast member (over at DC, for example, the latest Robin just perished), or gain a new costume (in Spider-Man's case, a costume he gained on a distant planet turned out to be a sentinent lifeform). But no matter how seismic the event might seem, fans know that in time it will somehow be reversed, or glossed over, or something. This circling back to status quo (or a close proximity of it) is accepted as the only way these characters can have ongoing adventures for decades upon decades. They have to change but yet still stay evergreen. In the pages of Superior Spider-Man, Marvel is currently telling perhaps the most fascinating example of this type of status quo upset yet seen in superhero comics. Under the pen of longtime Spidey scribe Dan Slott, Spider-Man's enduring arch-foe Doctor Octopus, found a souped-up scientific solution to the impending death of his withering body - he switched brainwaves with Spider-Man. In one wild stroke, Peter Parker found himself trapped in the dying body of his enemy while Doc Ock had a new lease on life in Peter Parker's body. In Amazing Spider-Man #700, Ock prevented Peter from reclaiming his own body and let Peter pass away inside of Ock's dying shell. The saving grace was that, in a Hail Mary pass, Peter unleashed a last-gasp info dump into Ock - forcing the melgalomaniacal villain to experience the various life lessons that had made Peter into a hero. A transformed Ock vowed not just to carry on Peter's legacy, but to find a way to be a better Spider-Man - a superior Spider-Man, hence the launch of Superior Spider-Man #1. I loved the perversity of the concept from the start. The idea of putting Doc Ock, even a slightly less amoral one, in the driver's seat of Marvel's most beloved hero - their "everyman" character - seemed like wicked fun. And it has been. But five issues in, it's also been so much more than I expected. The thing with these status quo upsets is that they always seem very easy for future writers to wiggle out of, so their long term impact on the character is never much in question. This, however, is trickier to resolve. Whenever Peter is able to return from the dead and wrest back control of his body, Slott has it set up so it won't be a simple matter of triumphantly popping back in. At the end of ASM #700, Peter realized that in trying to kill Ock (desperate not to let his body be used for evil, and with only seconds left to live, he threw both himself and Ock out a skyscraper window in a death plunge) he crossed a line that he swore he never would and that, even if he got his body back, that he could never be Spider-Man again. So even if he physically returns, his life as Spider-Man is over. The real masterstroke of what Slott's been up to, though, is that Ock's attempts at being a better hero (and even a better Peter Parker, one that's more attentive to his Aunt May) are not all bad. Far from it. In fact, it's hard to argue that he isn't the superior Spider-Man as he puts his brilliant scientific mind as well as his gift for meticulous planning towards being more efficient in guarding NYC than Peter ever was. The catch is that even while working towards goals that are beneficial to others, Ock's core nature can't help but seep through. He is working towards the greater good but this is someone who can't hold his ego in check and who doesn't doubt his right to implement any strategy as long as it produces the results he's looking for. This is a man who has been a global threat in the past. What will he do in order to be the absolute best in the superhero set? Based on what's transpired so far - including the shocking events of SSM #5, it's enough to make any sensible Spidey foe surrender on the spot. And it seems like we've only seen the tip of the iceberg so far. While Slott had been dutiful in tending to Spidey's legacy in his solo tenure on ASM, the kind of gentle caretaker that comic writers are expected to be - keeping the book and the character as intact as possible until it's time to pass the torch again - SSM has him in terrorist takeover mode. Not knowing what this Spider-Man (dubbed "SpOck" by some online fans) will do next or whether Ock will be redeemed or be further damned has made the character of Doc Ock (usually simply the target of fat jokes) more compelling than he ever has been - a gripping, impossible to pin, bundle of contradictions. And it should be noted that he's funny, too. Not in the smart alecky way usually associated with Spidey but in his impatient condescension towards those he considers less than his equal (virtually everybody). In recent years, we've become more comfortable with villains as protagonists. Maybe it's a growing embrace of moral relativism that lets us be ok with a character like, say, Dexter. Or maybe we just find it hard to dislike goal-orientated characters who are really good at what they do. Whatever the case, Slott has still done something remarkably subversive - he's not only had a villain kill a beloved hero and take over their life but in the process turned them into someone that we're able to root for. 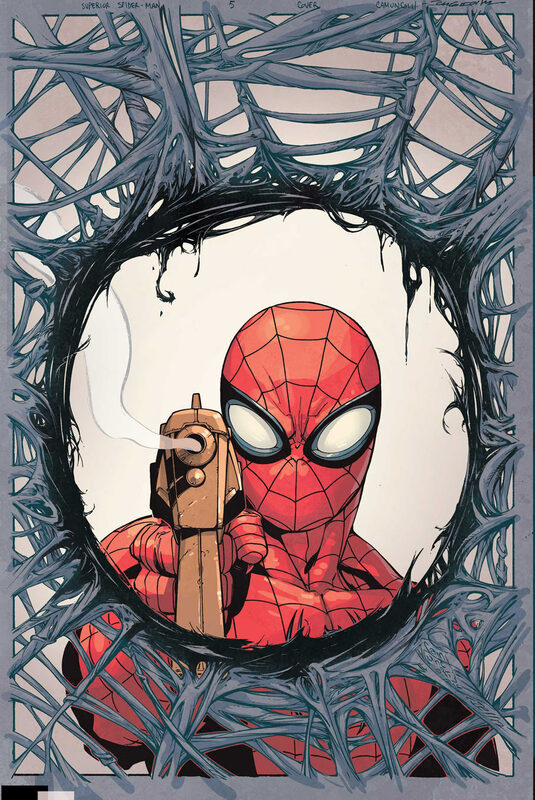 It's that kind of audacity that makes Superior Spider-Man the best roller coaster in comics right now - a status quo change that might just stick (for awhile, at least) as well as its title character sticks to walls.